Ken Choi Huang and Hue Chung Khee were busted with 167.9 pounds of high-grade marijuana. Asians behaving badly... million-dollar marijuana bust edition! Last week in South Carolina, two men from Colorado were busted with nearly $1 million worth of weed during a traffic stop. Ken Choi Huang and Hue Chung Khee were traveling on I-85 in a van when they were pulled over by a sheriff's deputy in Gaffney, purportedly because the vehicle was failing to stay in its own lane. 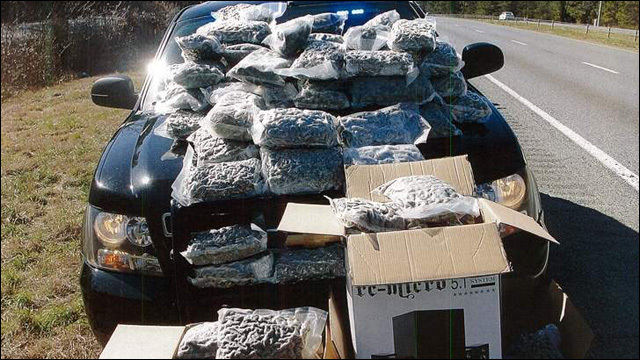 The deputy reportedly detected the smell of marijuana, and upon searching the van, found boxes and garbage bags full of packages of high-grade marijuana -- 167.9 pounds worth more than $900,000. A sheriff's office news release said the deputy was given consent to search the van. Inside, he found six boxes and a garbage bag filled with 156 vacuum-sealed packages of marijuana. Cash was also seized during the stop. The 167.9 pounds of high-grade marijuana is worth more than $900,000 on the street, officials say. The drugs were headed for distribution on the streets of Charlotte, NC, officials say. Huang and Khee were arrested and charged with trafficking marijuana.